The stylish new 2018 Audi Q3 is the luxury brand's smallest and least expensive SUV. It's a compelling entry in the highly competitive small-luxury-SUV segment where it competes against the Mercedes-Benz GLC-Class, the BMW X1 and the Lexus NX. The new Q3 offers all-wheel drive, a luxurious interior and Audi's legendary fit and finish. The compact-crossover SUV seats five. Benefits of an SUV but still compact enough for city life. My vehicle is perfect for those looking for the benefits of a small SUV. I am still able to squeeze into most spots living in a big city but have the comforts of a bigger vehicle. My biggest issue was the antenna on my newly purchased vehicle was defective and needs to go right to the dealer to special order a part. My vehicle comes equipped with side assist, navigation, backup cameras and a moonroof. It unfortunately does not have the highest Audi technology system but still is fully functional for a less car savvy person like myself. Great drive and great size. The look and feel of the car is great. I like the leather seats and the sunroof is amazing. I do not like the function of the GPS and how you enter in addresses. I wish that could be a little easier. Also, I don't like the complicated way to call someone from my car. It is easier to just pull my phone out and search for the contact. Making is unsafe while driving. It is an okay vehicle and I am not satisfied with the money I am paying. It accelerates pretty slow and it uses up a lot of gas, the mileage is not efficient enough and gas is expensive since I live in Texas and need to drive a lot. I haven't had any mechanical issues yet since it is a new vehicle. Comfort level is okay and features could include more for the basic model. 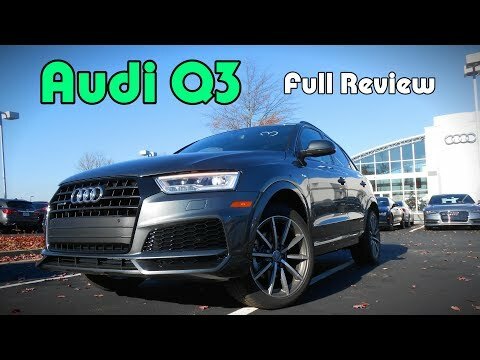 2018 Audi Q3 review: buy now or wait?